An official prepares ballot boxes before their distribution to polling stations in a warehouse in Jakarta, Indonesia, Apr. 15, 2019. "Over time I have noticed that competitive politics increasingly divides the country socially, though not so obviously along class lines, as in Europe. In Indonesia the electoral divide is, alarmingly, along religious lines — between Muslims and non-Muslims,” he wrote. 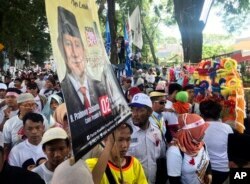 “Indonesia since 1998 has actually become, I would argue, the most stable democracy in Southeast Asia,” Neumann said. FILE - Indonesian President Joko "Jokowi" Widodo, center, holds the Asian Games torch as he runs during an independence day ceremony at Merdeka Palace in Jakarta, Indonesia, Aug. 17, 2018. “If he doesn’t get re-elected it will be because of millennial voters and bear in mind that 60 million potential voters out of a potential of 190 or more million voters are under the age of 30, so it’s a fair chunk of the vote,” he said.